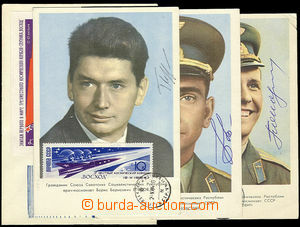 1965 USSR color postcard with portraits and manual signatures astronauts P.Popovič, V. Bykovskyj, B. Jegorov + FDC with miniature sheet to Anniv flight Voschodu, 2 postcard with wrinkled corners. 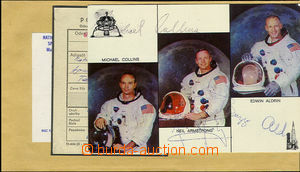 1969 USA color postcard with autographs astronauts Apolla 11 M. Colins, N.Armstrong, E. Aldrin, handwritten signatures fixem less distinct + certificate of mailing and front part envelope/-s from mailing from NASA. 1910 - 12 nobiliary correspondence comp. 8 pcs of Austrian PC with nobiliary recipients. 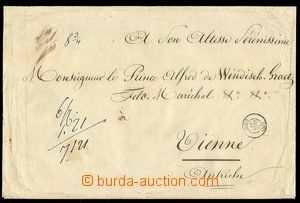 1895 HOLUB Emil, folded letter from Germany sent to cestovatele to Vienna On back side big noble seal good condition. 1927 - 33 MASARYKOVÁ Alice (1879–1966), daughter T. G. Masaryk, public functionary, comp. 2 pcs of letters (1x from Monte Carlo) and 1 postcard (Palestine) with autograph + 1x preprinted děkovný letter. good condition. Interesting. 1935 KOŽELUH Charles (1895–1950), versatile sportsman, Czechoslovak representative in tennis, ice hockey and football, from year 2006 member of International Tennis Hall of Fame; 2 pcs Ppc sent from USA - description turnaje in tennis with signature. good condition. 1945 SKUPA Joseph, comp. 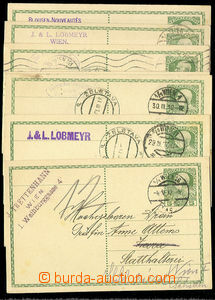 2 pcs of cards with additional-printing theatre and vlastními signatures. 1947 BAŤA postcard sent from USA CDS Belcamp 2.Jul.47, addressed to to Zlín with signatures family Baťových - Vanda Baťová, Bohuslav Baťa, Bohumír Baťa and George Baťa. Without damage. 1949 BENEŠOVÁ Hana (1885–1974), President's wife, autograph with date 18.I.49 on/for pre-printed acknowledgments + envelope. KLENOVÁ Eva, actress, signed photo, good condition. KŘIČKA Peter, poet, B/W. photo with signature, postmark photo Sudek Prague. PIŠTĚK Theodor, actor, printed photo signed whole name, slightly wrinkled margins. 1906 RAIS Charles, and other on Ppc with New Year's congratulation. 1942 DOHNAL George, actor, signed photo, superb. 1971 VENCLOVSKÝ Francis, Czechosl. plavec, card with one's own signature.